I couldn’t believe it and it gave me the giggles! I guess I do equate the word “bore”d to a 4-letter word, one that no mom ever likes to hear! It is one word that we don’t use in our house. Not because it’s a bad word or that we don’t let anyone say it, we just never introduced it…. probably because hearing it makes the hackles stand up on my neck. It took a little while for me to figure out what he meant. Here’s my take: The only company I was keeping was myself. I had few friends and no outside interests besides working 24/7. It was just the kick in the pants I needed. With a little wounded pride, I started getting involved by going to church, tutoring a Kurdish family of men (story for another time), taking a flower design and then a calligraphy class, going to the gym regularly, and planning my wedding. Getting involved in things outside of myself helped me to use my time more wisely because I was busier, taught me some new skills, and helped me to be less self-obsessed. Is it true that only boring people are bored? Why Do We Have Bored Kids? Children who attend all day school live in a very structured environment when they are out of the house. Their after-school time is filled with homework, chores, and activities (sports, scouts, music lessons). Children actually thrive on structure and routine (IE. Having a plan for the day). Are we so busy planning their day, that we don’t give them downtime to be creative? What does “I’m Bored” really mean to your child? I don’t know how to structure my own time – please help! I don’t know how to slow down and let events unfold. You’re ignoring me and I’d really like some attention. I’m feeling anxious and need to know the plan for the day. 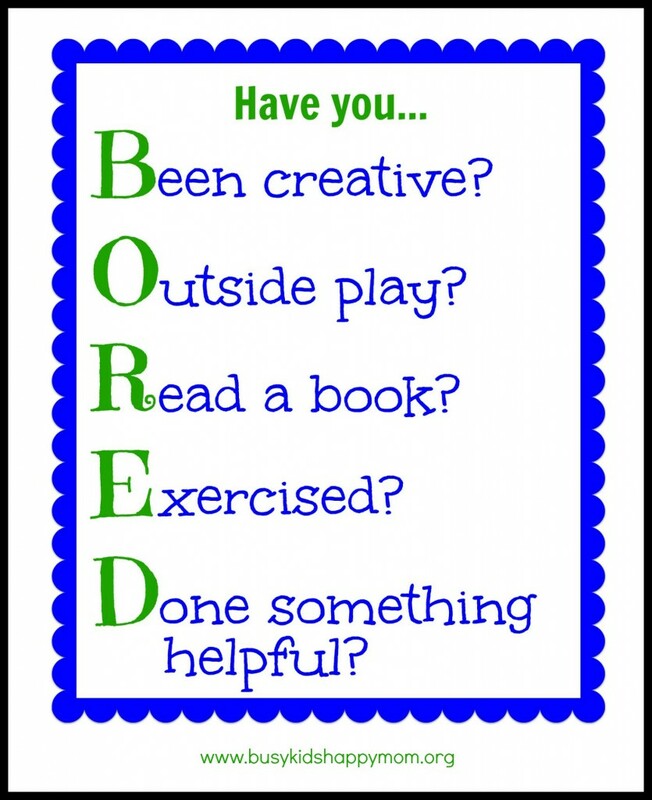 How can you help with “Boredom”? Take the “B” word out of your child’s vocabulary. *Raise your hand* … who has said one of the following? Have you ever thought that occasional boredom might just be recess for your child’s brain? 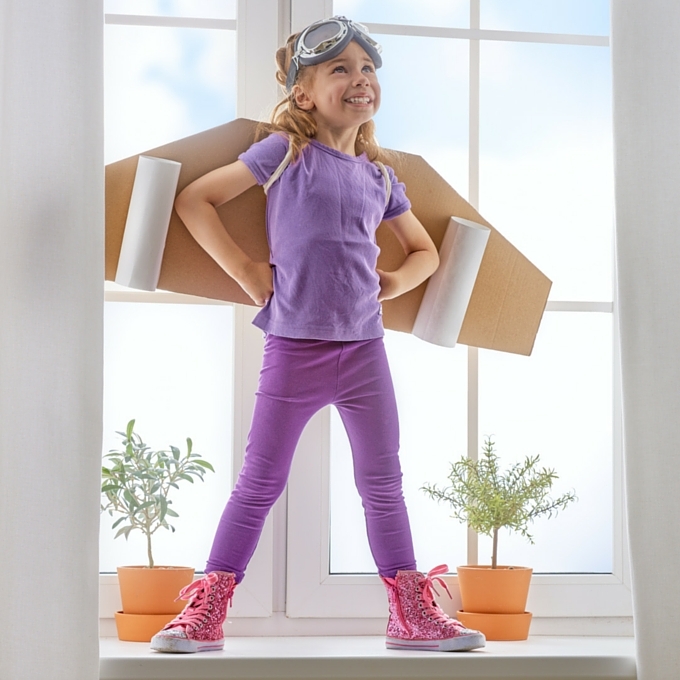 Kids need to be encouraged to be creative, problem solve, play games, have free time! 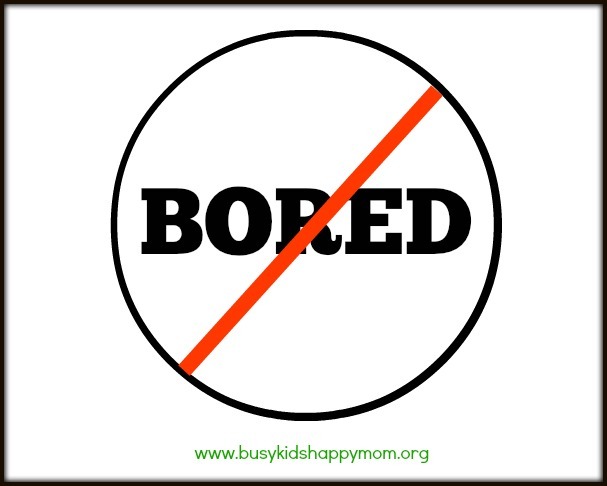 Your kids have a choice: Boredom is a choice that people make! There are a hundred things to do at any given moment. It’s a procrastinators excuse for not getting things accomplished. Having nothing to do is a part of life. What would be do if the batteries on our phone died, we didn’t have computers for a day, were stuck at home? Would be stare at the walls and cry? No, eventually we’d find something to do: read, a home project, talk to a friend, write a letter, make something, or cook. It is not your job to create entertainment and magic for your child 24/7. We are not a cruise director. But if Television, videos, and video games are not an option, what should you do? PLAN – Do you have items that are accessible for your kids to play with? Do they earn technology time? PREPARE – Do you need to stock up on art supplies or go to a yard sale for more outside equipment? ENCOURAGE CREATIVITY – Some simple demonstrations of how to draw on paper or play tic-tac-toe. Make a Bucket List of Family Goals or brainstorm ideas you can do when you have “free time”. Get excited about “free time”. Encourage them to like being by themselves!